It’s important to select a CNC machine shop that has achieved industry recognized certifications. When it comes to contract manufacturing, the final product must be produced to the exact specifications to make it successful. A machine shop that does not produce a quality product will likely not have earned special certifications. JW Machine is proud to be Joint Certification Program (JCP) certified, System for Award Management (SAM) registered and International Traffic in Arms Regulations (ITAR) registered. We also comply with ISO 9001 and MIL-SPEC quality control standards. Location is important when it comes to contract manufacturing. 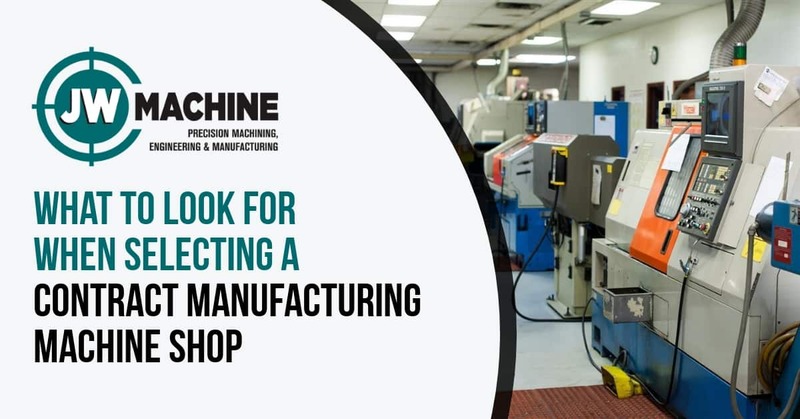 Selecting a CNC machine shop that is either local or close to major forms of transportation could be a cost-saving factor. JW Machine is located near two major international airports as well as rail lines. We are also less than 100 miles away from two major sea ports. What do customers say about the contract manufacturing capabilities of the CNC machine shop you are considering? There are hundreds to choose from, all claiming to be the “best”. JW Machine is proud to have satisfied customers from a wide variety of industries who can attest to the quality of our contract manufacturing process. Are you in the market for a quality CNC machine shop to handle your next contract manufacturing project? If so, give JW Machine a call today!